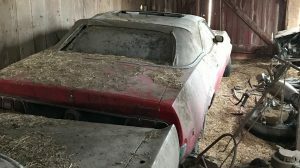 As an Australian writing for Barn Finds, one interesting thing that I’ve discovered is how forgiving Americans are when I make the occasional mistake. Now that I’ve said that just watch me make a complete meal of this! Located in South Milwaukee, Wisconsin is this 1968 Camaro Convertible. For sale here on eBay this project comes with a clear title and a BIN of $7,900 and the option to make an offer. 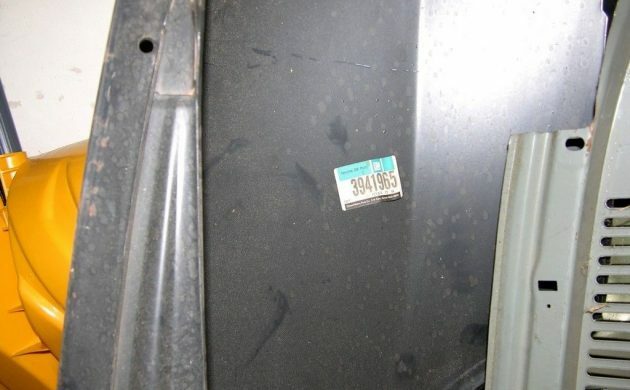 The seller states that this Camaro is dirty from being in storage. I think that this is only a minor issue compared to some of the others facing the new owner. There are some people who would look at this project, throw their hands in the air and then walk away. There are other folks who would look at this as a blank canvas and who wouldn’t be able to wait to start it. Either way, there is a lot of work ahead for someone on this. Firstly let me assure you that there is no engine or transmission. These were consigned to the bin when the car was disassembled. Forget “numbers matching”, this is your chance to build a Camaro to exactly the specifications that you want, whether it be period correct or whatever you can imagine. The next thing to consider is the shell. From the way that I interpret the ad, the car was disassembled and the shell dipped and primed some 30 years ago. It has been in storage ever since. I think that it’s stating the obvious, but I suspect that this needs to be returned to the dip. There’s just enough corrosion in awkward places to rule out soda blasting. I’m not a fan of having to dip a shell more than once, but I can’t think of an alternative. Even though there is no engine or transmission it appears that the rest of the drive-train such as suspension, brakes and the diff are all present. Some parts appear to have been reconditioned and some haven’t. Regardless I would be going over everything. If these components have been sitting for 30 years then seals and grease will be dried out. Better to check now than to suffer an expensive failure later. Selecting photos to publish has been a bit of a trial. 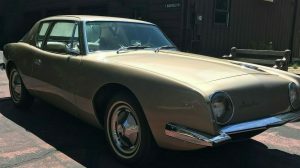 If you are even remotely interested in this car I suggest that you check the ad. There are more than 260 photos to choose from. What I can tell you is that it appears that virtually everything is there apart from that engine and transmission. Most of it is pretty dusty and dirty. There are also a fair few NOS parts, so the basis is there for a good car. I have only ever assembled a car from this stage once before, and that was my racing car. Part of me has always dreamed of stripping a road car to this stage and building it the way that I want it. Having said that I find this one pretty daunting. 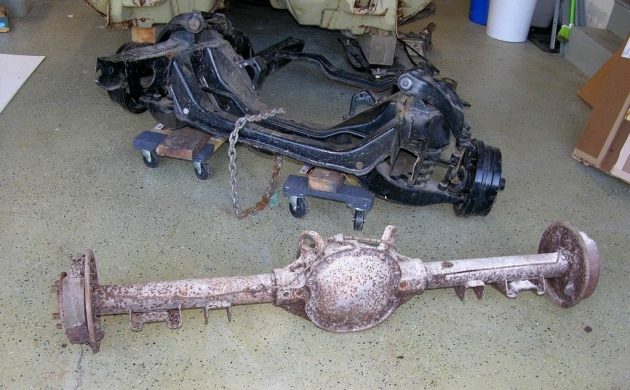 The beauty of dismantling a car and then reassembling it is that you have some idea where each part goes. Unless you are experienced with Camaros, assembling this from scratch could be as easy as assembling the Golden Gate Bridge. Any takers out there? Obviously the whole rear quarters have been cut out of this car, so lots of welding and bodywork will be in order. I’d think the transportation could be complex…the new owner would need to pick the car up, right? Too much trouble for me; my friend just bought a nice one already done for about 16K. As Americans we hope you are forgiving about what we call a Falcon. You are forgiven my friend. My current transport is a 1996 Ford Falcon utility. I bought it as a tow car when I used to race. Now that I’ve hung up my helmet I was going to sell it, but it’s like a part of the family. Unfortunately there are too many parts still assembled. The rear-end still together, just terrible. The mufflers just have too many exhaust pipes, still attached, very concerning. The seat, oh no the back is still attached. I can’t abide by that. Is that OBO of $7000, is what they will pay to get it off the lot. Nothing worse than someone not knowing anything on cars but knowing how to break things up and loose bolts . I usually sweep in and get these for two grand due the pain and suffering!!! I wasn’t going to comment but I have to. To the person listing this sale. Really? 68 Camaro Convert 327 Automatic as RARE? HOW? 35K miles…..really?…., minimum 135K. 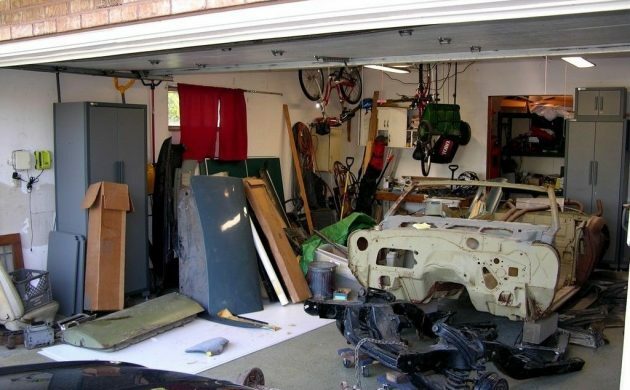 Owner cherishes but is just downsizing his projects….like you are doing someone a favor?? 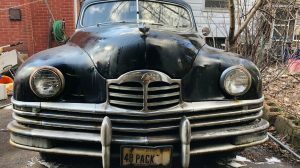 Listing in SOUTH Milwaukee WI….like it is SOUTH Carolina and what…..SOUTH WI doesn’t have massive RUST problems like the rest of Wisconsin?? Sorry, I am NOT personally attacking but how stupid do you think people are? I have never heard someone “baffle me with (so much) BS” in less than 2 sentences before! Pretty sure you need to be prepared to either give this pile of parts to some one who can figure out what to do with it for FREE, just sell the parts or if it were me you would need to be handing ME $7,000 just to take this mess off your hands. I am sorry but I can’t stand when people advertise this way. Just because you describe a pile of Dog Sh– as “Golden Brown” doesn’t mean it has anything to do with gold or the fact that is it still a pile of Dog Sh– !! Good Luck, trying to get that kind of money,for this hunk of%$%#^&**!!!! I bet they cannot wait to get the space back in their garage. I would offer $1500 including delivery here to the UK. At least the seller has come down from their initial asking price of $9,950 when they ran their first ad for this car on eBay. Lotta coin for a VIN! What you can’t put it together with the massive pile of parts. Everything there except kitchen sink. Including the am radio. And I am sure everything is bagged and tagged. Can you say puzzle night. ordinary primer attracts water and holds moisture. 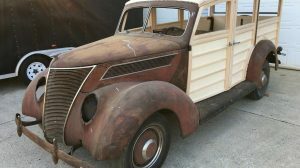 That’s why when watching “Overhauling” and similar shows, one of the first things you see them do following media blast is to seal the car with an epoxy sealer before doing repairs, or modifications, so the parts of the body that are not going to be worked on / modified don’t start rusting. 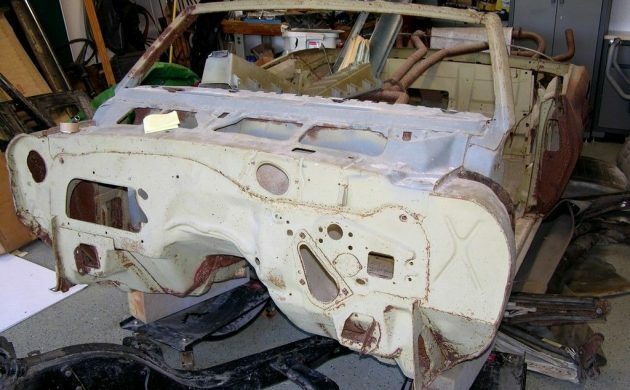 I’m pretty sure the primers available 30 years ago would not have sealed the bare metal. Since i retired I think i also retired Camaros and Mustangs. They have been done in every conceivable configuration to the point that they just dont do anything for me any more. Lots of other stuff out there thats more interesting and much much rarer. Im not knocking these cars. Just saying that the price of all this stuff is pushing our youth toward the Japanese market. Old Hondas and Toyotas are now climbing the charts too. 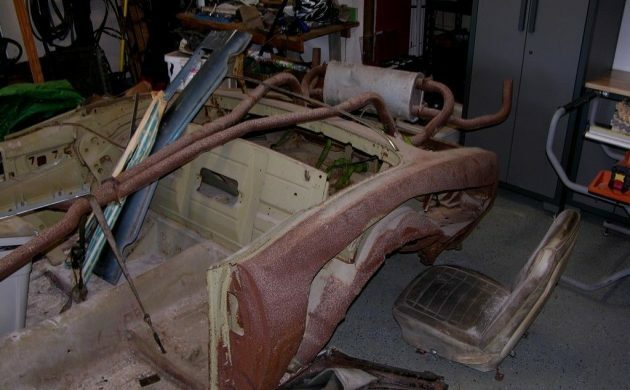 Maybe we should pass a law that says if you strip a car down to the bare bones, you should be required to put it all back together before you try to sell it. The last couple of years I have seen way to many of these deals. It’s just ridiculous. Well, if you have a blank check, even though this may upset some purists, and seeing as quarters are needed, the car has been dipped, and who knows the condition of the body under the primer now, I’d say buy a dynacorn body keep the VIN and good usable miscellaneous parts, and scrap the old cut up body. At that point, and seeing as it won’t be numbers matching anyway, what have you got to lose other than the $.